Super Mario Bros. 2 | Shocking Videogame Secrets! IT’S A TRAP!! BAIL OUT NOW YOSHI! Well they have kinda gone back on that since then. It was supposedly more of a NoA decision for the translation for some strange reason. 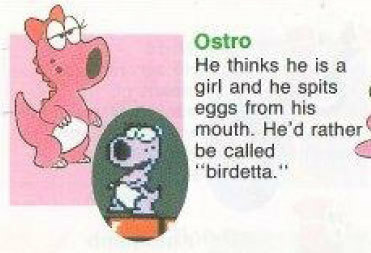 Birdo (aka Catherine) was always female in Japan anyway. Well actually according to wikipedia, it was always a male in japan? now i’m more confused. Well in the Mario Strikers Charged manual, it refers to Birdo as ‘he’. Cacildo´s note: Well, it is still in the open if Birdo is a male or a female. Or if it’s called Birdo, Birdetta, Ostro or even Catherine. And nobody can answer for sure if Nintendo of America really decided that this transgender detail was a little bit too much for the american audience and decided to cut it and its balls altogether. So this one remains the biggest Nintendo Gender mistery, but I will always love Birdo no matter what.